Perfect for the younger rider in your barn, or for those who like things on the smaller side. 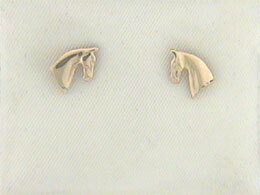 Here we have some tiny three gaited Saddlebred earrings. Great gift for anyone who loves horses. Available in 14kt yellow, 14kt white, and sterling silver.